Velca’s experienced physiotherapists can provide accurate diagnosis and targeted treatment plans to get you back on your feet. Based on the latest research, we combine both hands-on techniques and exercise-based rehabilitation to treat a range of musculoskeletal injuries and conditions. During our initial consultation, you will receive a thorough assessment, followed by a detailed explanation of your condition. We’ll then prescribe a personalised plan combining follow-up appointments, suggestions for lifestyle changes, and remedial exercises you can perform at home. These self-management exercises will not only provide relief between visits, but also help in preventing further injury. As an ACC registered clinic, we can offer subsidised physiotherapy treatment, with no referral necessary. Simply fill out the appropriate forms when you attend your appointment at Velca. Physiotherapy aims to restore function and independence in people who have a condition caused by physical, neurological or cardio-respiratory disorders. Through a combination of massage, exercise and mobilisation, physiotherapy can improve mobility, functional ability, and overall quality of life. Our physiotherapists will not only provide immediate relief from symptoms, but treat the underlying cause of your problem. Combiningrehabilitation and prevention techniques, we deliver a high level of care to our patients, and consistently produce excellent results. Soft tissue massage – Soft tissue massage targets the muscles, tendons, ligaments, and connective tissues. Utilising a range of depths and pressures, this technique can provide relief from pain and assist in muscular rehabilitation. Deep tissue massage – Targeting the deeper connective tissue, this technique focuses on loosening muscles, releasing toxins, and increasing blood and oxygen circulation. Many people find this technique provides immediate relief from pain and tension. Remedial exercises – After your session, your therapist will prescribe some remedial exercises that you can perform at home. These stretching and strengthening exercises will help you to prevent further injury, and maintain your physical wellbeing in the long-term. Injury rehabilitation – Velca can provide specialised treatment for sports injuries, post-surgical rehabilitation, occupational overuse syndrome, and other conditions. Using a combination of techniques, our therapists will devise a targeted treatment plan for you. Joint mobilisation – Using targeted manipulation and repetitive movement techniques, Velca’s trained and experienced therapists can restore full joint motion, release muscle spasms, stimulate joints and provide relief from pain. By working with the Velca team, you can make positive changes towards a more healthy lifestyle, free from pain and injury. Our range of services also includes chiropractic care, personal training, and massage therapy. Read more about us, or get in touch for advice on how our team of physiotherapists can help you achieve optimal wellness. The Velca Health Centre in Auckland is committed to alleviating your discomfort and freeing you from pain. The holistic approach to health we take combines different aspects of healing and correction to form our unique Velca Method. At Velca, we approach pain with a multi-step method that aims to correct, relax, strengthen and maintain the body – supporting good health and providing permanent solutions rather than temporary fixes. Through a mix of chiropractic and massage therapies alongside a strong focus on fitness training and great nutrition, you’ll find that the Velca Method is by far the most effective to ease suffering and inspire healthy living. Chiropractic – Through chiropractic care, we aim to correct spinal dysfunction, bad posture and habits that lead to pain. The chiropractic services we offer are the first step to identifying problems, alleviating suffering and breaking free from pain. Massage Therapy – Helping you to relax, loosen the muscles and find relief, massage therapy is our second step that improves circulation and works pain out of the body. Relaxing is a key part of eliminating pain while it paves the way to improve your overall health and well being. Physiotherapy - Aims to restore function and independence in people who have a condition caused by physical, neurological or cardio-respiratory disorders. Through a combination of massage, exercise and mobilisation, physiotherapy can improve mobility, functional ability, and overall quality of life. Personal strength and fitness training – Fortifying the body through personal fitness and better health, our fitness programs are tailored to you to help strengthen the body and prevent pain from returning. We want to enable you to break free from pain to live a healthier, more enjoyable life. 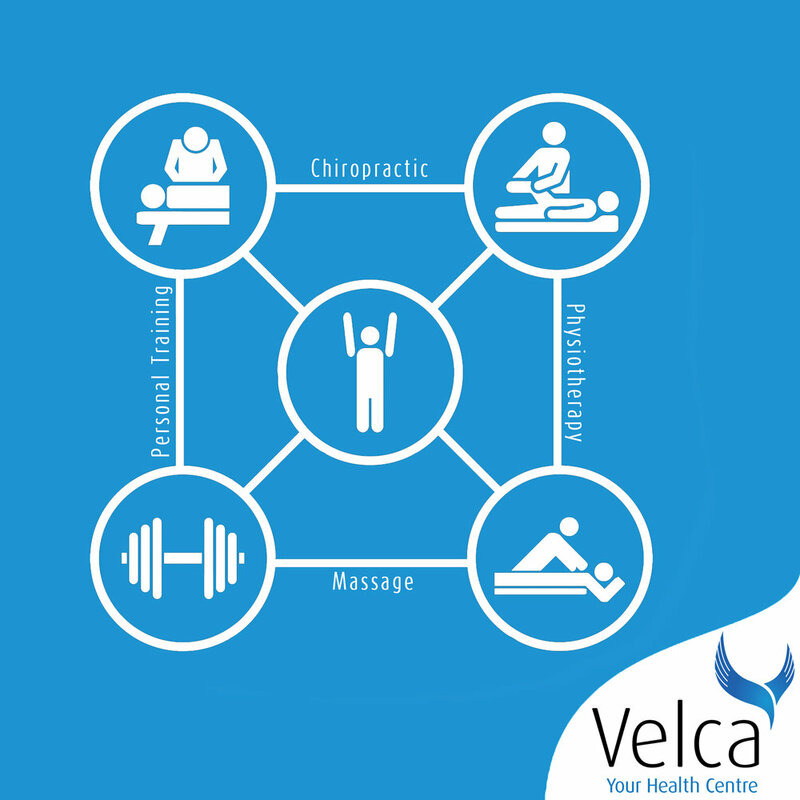 Visit the Velca Health Centre in Howick for a holistic approach to your well being. We don’t just offer chiropractic services, we work to better your life in every aspect by improving your health and preventing pain from returning. Break free from pain – call us today to find relief through chiropractic care, massage therapy, physiotherapy, personal training, and a positive focus on fitness and health.